The rate includes driver random, pre-employment, post-accident, “reasonable suspicion” and return-to-duty drug tests. 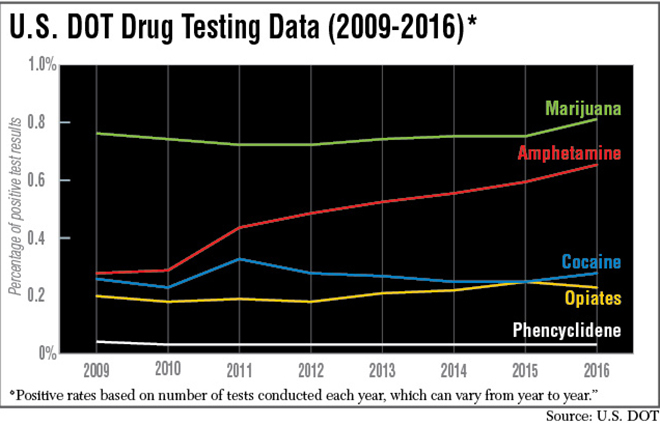 The failure rates for phencyclidine, or PCP, remained about the same at 0.02% but declined 0.24% to 0.22% in the test category that includes heroin, codeine and morphine. In 2016, about 97% of the 5.5 million lab­-reported random DOT tests were taken by truck and bus drivers, down from 6.3 million tested in 2015, according to the report. The decline in overall numbers of tests taken was largely due to a reduction in the agency’s required random testing rate to 25% of commercial driver license holders in 2016, compared with 50% in 2015, a Federal Motor Carrier Safety Administration spokesman said. Drivers who fail drug tests are immediately no longer permitted to drive. They must voluntarily enter a program for evaluation and treatment for substance abuse if they wish to return to duty. They also must pass a subsequent drug test, according to FMCSA regulations. “There’s an opioid epidemic, and DOT’s drug testing program does not include the most widely abused prescription opioids,” Abigail Potter, manager of safety and occupational health policy for American Trucking Associations, told Transport Topics. The same is not true for many motor carriers who, in addition to urine tests, do hair testing that also tests for all of the broad classes of opioids, Potter said. The rate of suspected tampering or cheating on tests “remained low but is a continuing concern,” according to the report. The driver positive drug test rate is significantly lower than a recent analysis of more than 10 million general U.S. workers drug tested by the commercial drug diagnostic firm, Quest Diagnostics.